Nodaway County was officially founded on February 14, 1845. Its first sheriff was Bartlett Woodward Curl. (Correction:) He was officially elected sheriff in the county's first general election on August 3, 1846. This appeared in the local paper of that date. 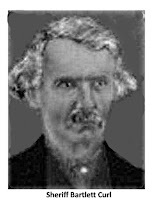 Sheriff Curl would serve until August of 1847, when a new sheriff was elected. Later, the elected terms would run from November to November, with sheriff's taking office as soon as their bonds were presented to and accepted by the Nodaway County judges. Sheriff Curl's bond was for $1,500.